Apple beats both Dell and HP for it’s telephone customer support by a pretty big margin. It’s no surprise – if you’ve ever called Dell with an issue, chances are you’ve witnessed how easily a “quick service call” can turn into a recurring nightmare. Not to say Apple doesn’t have it’s flaws, but the numbers certainly represent the majority of stories I hear. Of course, it’s nice when you don’t have to call the manufacturer in the first place, as is also more often the case with Apple. Cyborgs can do way more than humans. 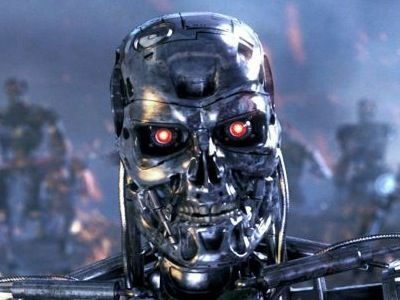 They can turn themselves into molten metal, they can make their eyes glow red, and most of all they can use Cyborg Interfaces. Human interfaces, or User interfaces are slow, clunky, and passé, at best. You see, when a human has to interface with a system, they need pretty icons, practical and familiar layouts/design, and structure. Cyborgs need none of these. Linus Torvalds is a lower-case “c” cyborg. He doesn’t need a Human interface any more than a meteor needs wings. Mr. Torvalds, and Cyborgs, are both technically superior to us. They can process data at incredible speeds. They can also type really, really fast, so using interfaces such as the command line is easy for them. But for us mere humans, we need a little help. It’s not that our minds are weak. They’re just too busy monitoring our bodies as they replicate skin (Cyborgs don’t have this problem), or keeping the ol’ ticker going (don’t confuse Cyborgs with the Tin Man – they will probably kill you for it as they are and always will be heartless). How might you respond if you were asked to drive a car using a keyboard and a monitor? Would translucency benefit your computing experience as much as it does pouring a glass of milk? We (well, most of us) mortals have certain expectations when interacting with any system, and if these expectations are not reasonably met, we become frustrated. The net effect: we leave, we stop using it, we throw it away, or we make fun of it. A good interface is always simple, clear, and rarely noticed by the average human. A good interface is not defined by a certain color palette, a set of icons, or a font. A good interface is not a set of buttons or graphics that take you through the steps. Sure, interfaces use these and other elements, but a true Human Interface is built around the Human for whom the system was originally intended. If they struggle to use it properly, they aren’t doing something wrong. The interface (and possibly the system for which it is built) is flawed. Another defining characteristic of a great interface – if not always, then often – is the lack of extensive documentation detailing how to use it. This is not to say that you can just throw away your documentation and win the award. You need to carefully craft your product so that the number and order of the steps to complete a task or objective are sequential and obvious. An example of this is the Apple iMac. The iMac’s original manual was entered into the Guinness Book of World Records for being the world’s smallest manual, containing only 32 words — something revolutionary in a world where PCs were sold alongside their voluminous manuals outlining how to get the complicated machines up and running. The manual wasn’t short for brevity’s sake, but rather a reflection of the fact that the machine was simple to set up and use. A good user interface requires little instruction, because the interface is designed in the first place to satisfy the needs AND instincts of the end user. They will feel that using the interface is instinctual, natural, and even familiar. Keep these points in mind when designing your product. It will save you a great deal of time and money in the long run, not to mention the frustration you’ll save your customers as they try out your product or service. This can only lead to increased customer satisfaction which will in turn produce better brand evangelists for your business, a great reward for caring about your customer’s experience. Note this is not a request to be added as a friend, but your personal and private account login information. “Please list any and all, current personal or business websites, web pages or memberships on any Internet-based chat rooms, social clubs or forums, to include, but not limited to: Facebook, Google, Yahoo, YouTube.com, MySpace, etc.” the form reads. But Bozeman isn’t simply interested in finding out where to look for potentially embarrassing personal details; the city wants full disclosure, since the form demands username and password information for each. City employees will apparently be able to dig through any information applicants have put online, regardless of whether it’s accessible to the public. We spent a good part if today going through home videos of the kids over the last few years. What began as an exercise in cataloging what was on the DV tapes quickly turned into a multi-hour family veg. session remembering good ol’ times. Probably the most apparent thing, at least to me? Kids do grow fast. But don’t think the entire day was wasted on gushy sentimental crap. My wonderful wife served me a delicious breakfast in bed, I had some incredible steak for dinner, and we all went for a lazy Sunday drive right around sunset. I think I need more father’s days in the year. Thanks guys for the great time! I have to agree with this article. Although, of course, I wanted to hear that there were many more features in the “S”, and a much lower price for recent 3g buyers, I felt from day 1 (once all the whining started) of the announcement that it was quite a foolish platform from which the new iPhone-pricing-haters were standing on. I’m not saying I love AT&T, or that I think an iPhone is really worth $800 new/unsubsidized. But for such a large group of people to act so entitled was a little unsettling for me, especially when I belonged to that group, generally speaking. Nobody owes you the new iPhone 3GS, and nobody owes you a price break on it. If you want it now, pay for it. If you don’t want to pay, then finish your contract as you originally agreed. I will say, however, that AT&T is partly to blame for their issues today. They gave their first iPhone buyers a big pile-drive to the face, and seemed to be wielding quite a lot of their muscle when they wanted us to pay the unsubsidized price for the original iPhone, but then asked us to wait 2 years before we were eligible for a subsidized price of the 3g. Of course we all know they quickly made an about face soon after the original announcement of 2g-3g upgrade pricing. Yet, by trying to milk their new Apple customers, many of whom had just left another, better carrier for one sole reason (which was the iPhone) – this was a blunder on AT&T’s part that would come back to bite them. And it has. In spades. AT&T: Stop sucking so bad and don’t be so greedy. iPhone lusters (me included): Grow up, be reasonable, and realize that just because you can’t afford the full price of the new gadgetry doesn’t mean someone else should pay your way. Not even the sub-standard service provider, AT&T. 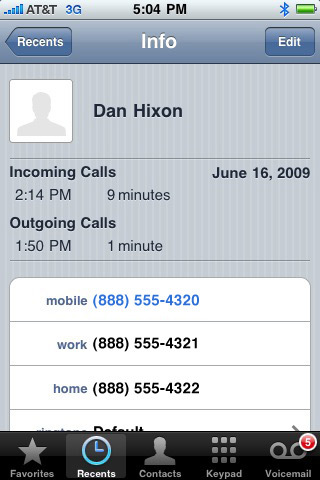 I wish I had a screenshot of the old iPhone 2.0 call info screen, because frankly, it sucked. I always lamented that there wasn’t any really pertinent information there, and rather just a bunch of wasted space. Well, to my surprise, once I had OS 3.0 installed and working, I soon happened upon the call info screen, and was almost giddy to see that there was now a useful display of data pertaining to the call(s) which I had drilled into. It’s little things like this that garner my overall appreciation for Apple products. While I’ve wanted this feature for some time, it’s like they read my mind with this most recent update. So many other interfaces are left wanting. And wanting. And wanting. And they never seem to change. Thanks for figuring it out, Apple! Go to your mail application, activate your cursor in the email body, and again press your finger down on the cursor until you see the magnifying glass. Let go, and the black copy/paste bar should appear. Press the paste button, and there you have it. You should see all of the images that you selected appear in the email. Note that you can also choose the “share” button, instead of the copy button after you’ve selected your images from the gallery. Be aware that depending on which approach you use, final image sizes will vary (i.e. copy/pasting will allow you to send the full resolution image, while choosing the “share” option to send the image to mail will cause it to be shrunk down to a more suitable “web” size). Something to be aware of if you need one or the other. Copy/paste is going to change my life. Again. I know copy/paste has been around for ages on mobile devices. I used it often on my palm p700 years ago, and there’s no denying it’s a very useful feature. The fact that tens of millions of mobile computing users chose the iPhone despite the glaring absence of simple copy/paste is quite a tribute to the phone’s revolutionary concepts and design. Still, it’s good to know that Apple woke up and got to work by bringing this basic function to the iPhone. Already, I’ve found myself using it more than a handful of times. And it only seems to get more fun each time I use it. I’m now looking for things to copy/paste just to use the feature. It’s a bit like an illness. Thanks, Apple. It’s nice to finally have a real computing experience on the iPhone. Against the loving wishes of the gestalt AT&T, there have been some enterprising young folk who have figured out how to enable tethering on the iPhone. In the U.S. Now. Of course, realizing immediately it was foolish to not have computer tethering available just because I was using a crap mobile carrier, I decided to give this highly immoral iPhone mod a whirl. I must say, it’s surprisingly fast. Clearly reports of safari page rendering times on iPhone being bottlenecked by the phone’s processor – and not the 3g network – are spot on. In a pinch, I could use tethering and ALMOST not notice the speed. That’s saying a lot, since I consistently get ~7Mbps download speeds at home. Please note: There is a simple way to do this, and a less simple way to do it. I’m linking to the simple way, mainly because *it’s simple*, but also because it’s how I did it, and I had no problems using this method. DISCLAIMER: YMMV. AT&T may hunt you down and cut off your fingers or rip out your tongue. You might be charged $7,633.27 in data charges. You may void your warranty. AT&T may void your life. You might fill your void with some sweet out-of-wireless-range-tethering-goodness. In other words, PROCEED AT YOUR OWN RISK. Scroll down to the spot shown in the screenshot below, then click on “download”. Now for the fun part: setting up your Mac/PC to connect via bluetooth. Alternatively, you can plug in your USB cable and share the connection that way. Setting up the iPhone to connect via Bluetooth on the Mac is still a bit sketchy. I had to choose “Any Device” instead of the “Mobile Phone” option when choosing a device type. It seems that this process requires a few attempts before everything connects, so let patience and persistence be your friend. Once you’ve got your connection set up, you should be able to turn wi-fi off (on your laptop/computer) and rock and roll with your newly tethered connection. There are a few more steps to getting bluetooth set up, but they’re pretty intuitive, and I’m typing this on my iPhone. Let me know in the comments if you have any issues and I’ll try to follow up with any help I can offer.